HomeFeaturedBiotech Journalism Panel Series Part 2: Who’s Great At Communicating San Diego Life Science? Biotech Journalism Panel Series Part 2: Who’s Great At Communicating San Diego Life Science? April 28, 2013 Mary Canady Featured, SDBN Blog Comments Off on Biotech Journalism Panel Series Part 2: Who’s Great At Communicating San Diego Life Science? Part of the motivation behind organizing our upcoming biotech journalism event is that we want to encourage more communication about the terrific life science advances in the region. In putting the panel of local science communication experts together, we realized that there are many other examples we can discuss to inspire you to promote your scientific work. 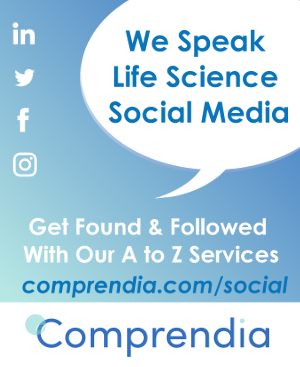 As part of our #SDScicomm series, here are 7 great San Diego life science communication efforts. First, though, let’s talk about why science communication is so important. As the online media landscape is developing, the public hears from many anti-science ‘voices’ such as sources that tell them vaccinating is a bad idea and that global warming is a hoax. We crunched the numbers from a recent Pew report (the data are on p. 11 and the analysis can be found in this Google doc) and found that there has been an 11% decrease in support for life science funding over the past 26 years. Surely the reasons for this are varied, and the Pew report also points out that the public has become more austere in other areas as well (p. 6). However, if your lab/institution/company has not yet felt the effects of shrinking government and investor support, you are definitely in the minority. Science communication is now more important than ever, especially as new sources of information are taking hold. Figure 1. 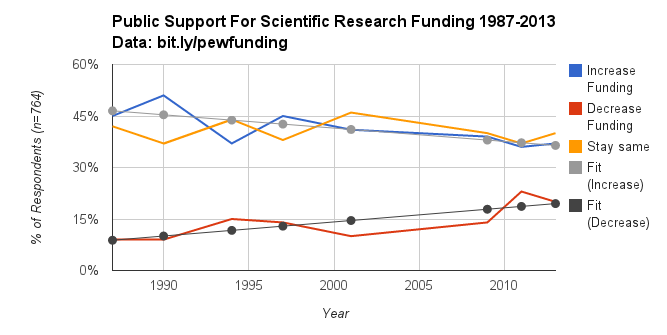 US public’s support for increasing life science funding has declined 11% since 1987. Image links to supporting data. Life Technologies’ Anti-Sequestration Campaign. In an effort to stop the government’s across-the-board sequestration funding cuts, Life Technologies implemented a campaign making it easier for scientists to contact their congressional representatives. According to Robin Smith, Sr. eMarketing Manager at Life Technologies, the campaign generated at least six thousand responses in a month (12 minute mark in video). Of course we all know that the sequester happened, but that doesn’t mean the efforts didn’t raise awareness. Indeed, the conversation is very active currently (follow #sciquester on Twitter) and life scientists should be vocal to their friends and families as to the impact on their work and lives. Life Technologies took a bold step and likely used a significant budget to back this campaign, they should be applauded. San Diego Entrepreneur’s Exchange (SDEE). The SDEE is a fantastic resource for startups and small companies, with frequent events and lots of ways to get involved. I attended an event titled “Built To Last, Not For The Exit” in which three local entrepreneurs presented their inspiring stories of how to create a long-lasting life science company in San Diego. SDEE is also active in supporting funding of small companies, providing education about getting Small Business Innovation Research (SBIR) Grants and support of pro-SBIR legislation. Sanford-Burnham’s Beaker Blog. We had Heather Buschman, Scientific Communications Manager at Sanford-Burnham Medical Research Institute, on our panel last October to discuss blogging from an academic institution standpoint. Heather is the tour de force behind Sanford-Burnham’s Beaker blog which is an excellent example of science communication as it offers news and insights to scientists as well as to the public. Don’t take our word for it, the blog has gotten numerous awards. We wish each of our outstanding research organizations had a blog such as Beaker. It would be even better if they also provided the infrastructure for every lab to have a blog. We can dream, can’t we? We provided a list of San Diego life science institution news and resources pages on our last #SDScicomm post. SciVee. One of the founders of SciVee is UCSD’s Phil Bourne, and the vision of this project is to allow researchers to communicate their research through video presentations. SciVee provides software to facilitate creation of presentations, and each can be paired with an uploaded document. Dr. Bourne is a long-standing advocate of science communication and open access, and is the Founding Editor in Chief of PLoS Computational Biology and Associate Director of the Protein Data Bank, in addition to being UCSD’s Associate Vice Chancellor for Innovation and Industrial Alliances. We are dying to get Dr. Bourne to speak at one of our ScienceOnline San Diego events, but as you can imagine he’s very busy! Salk Mobile Science Laboratory. I heard about Salk’s Mobile Science Laboratory from a colleague and had a hard time finding it on their website, it seems like a great but perhaps not widely publicized resource. The bus visits 18 schools a year, reaching 2200 students each year for the past ten years. The lab focuses on DNA-related experiments—wouldn’t it be great to have a bus for each area of life science? San Diego Festival of Science & Engineering (SDScienceFest). The SDScienceFest has been going strong since 2009 and I volunteered for the expo this past March at Petco Park. Through 35 events, 55,000 children and adults are exposed to the great science and engineering happening in San Diego. I overheard one child saying “This was the best day ever!” upon leaving the expo and several asked us when the next event would take place. Outreach to the public is incredibly important, and I saw only a small percentage of our 400+ biotech companies participating in the event. 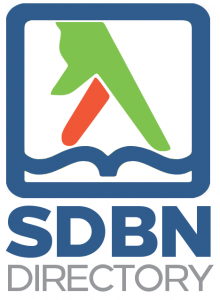 The SDBN hopes to improve the number of biotech companies participating in future SDScienceFest events. Crowdfunding. An interesting development in research funding is the use of so-called ‘crowdfunding,’ or raising money through public requests. The most popular initiative is SciFund, and the founders aim to help scientists better communicate their research through their campaigns. A few local groups have begun to use crowdfunding, including a lab at TSRI, a local company trying to cure Malaria, and an online forum for scientists. These efforts are all in their early stages, and time will tell whether this funding model is viable. If you’d like to get started with your own crowdfunding campaign, check out this great training program from SciFund. There are many resources to help you get started doing more communication and outreach such as ScienceOnline and Nature’s SpotOn science outreach initative. We will highlight the above and other local life science communication efforts at our biotech journalism event, and perhaps you know of others you’d like to share? Please leave them below, thanks!